At its core this pump is pretty much like any other pump. It pulls water through one end and lets it out another. What makes the In-situ pump unique are two things: 1) what it does with the water before it lets it out and 2) the fact that all of the water passing through the pump and being filtered is happening under water. You’ll notice on top of the pump two filters; all of the water that the pump pulls in is passed through these filters. The filters catch very fine particles and do not allow them to go through to the other side. 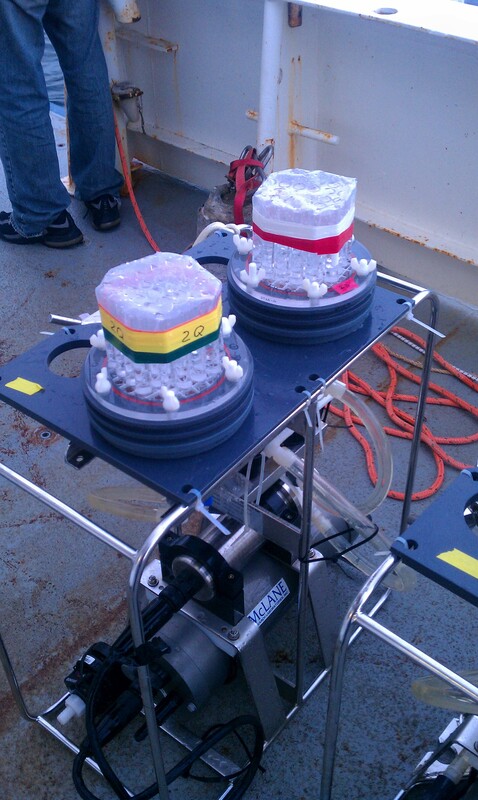 The scientist, in this case Dr. Kanchian, will submerge the pumps into the ocean wate r for up to several hours at a time. 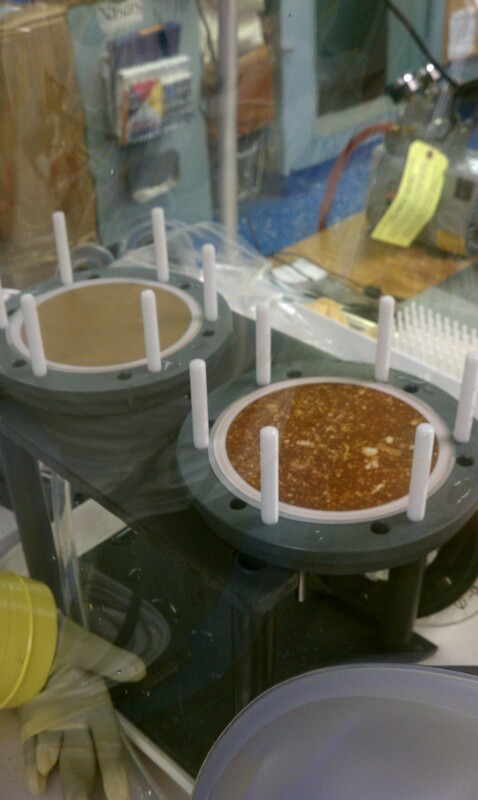 The pump will pass water over the filters; when the pumps are brought up to the surface after several hours, the material left behind will be analyzed. In this case Dr. Maiti is searching for the presence of a particular element, Polonium-210, in the organisms that would be caught by the filter. Since the scientist knows just how much water has passed through the filters per minute (in this case about 6 L/min), he/she can calculate the concentration of a material in that water. For example, if the pump ran for 30 minutes at a rate of 6 L/min, the scientist knows that 180 Liters were passed over the filter. If he finds that 2 grams of plankton were left behind in the filter, then an estimate of the amount of plankton in the water sampled would be 2 grams/180 L, or .011 g/L. The In-situ pump gets its name from where the filtering is happening. “In-situ” in Latin means “in place.” Since the in-situ pump is filtering water in the ocean, or the location of the water’s origin, it is referred to as an “In-situ” pump. A similar pump would not be called in-situ if it were bringing the water to the surface first and then filtering the water through the filters at a location different than the origin of the water. In this case, Dr. Maiti is filtering to find a certain radioactive chemical, Polonium-210. He predicts that Polonium-210’s concentration in these waters is higher than in other waters because this area lacks oxygen. In environments lacking oxygen, Po is able to leave the sediment it would otherwise be trapped in and become part of the food web. Organisms living in the hypoxic zone may be mistaking Po for Sulfur and using it in the cytoplasm of their cells, resulting in a toxic buildup of Polonium concentrations in their bodies.